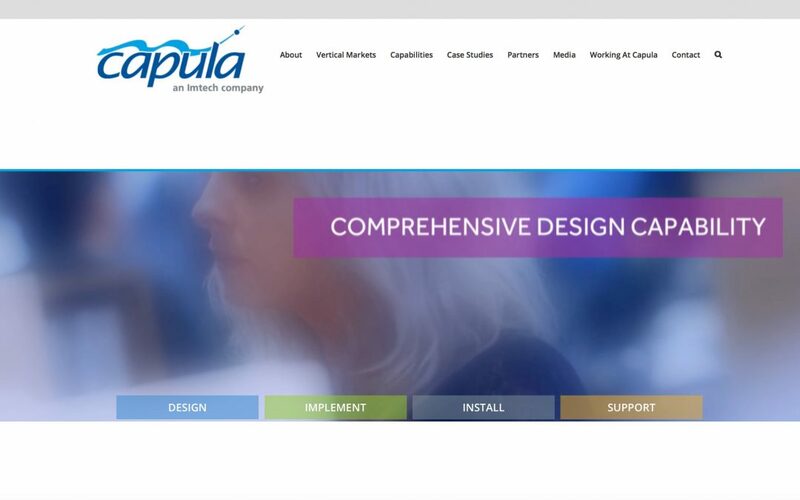 IQ Media has just designed and developed a new online presence and website for Capula a leading independent technology company that implements control, automation and real-time IT solutions across multiple sectors. In addition to a strong presentation of the brand mark and proposition, key content and landing areas on the homepage includes an animating video banner of images showing a range of impressive projects to grab attention, wow the visitor, whilst showing the consultation, automation, IT and support services on offer. A key objective of the new website was to help Capula to promote and attract key target market projects. This was achieved by iQ Media focusing the content on market rather than product and service orientated solutions. In addition to the main navigation menu and video banner the home page contains visual landing areas to promote their key services, technologies, latest news, key statistics and a twitter feed to provide up to the minute updates. The website is fully responsive and this combined with the home page and sub pages incorporating prominent call to actions helps to drive visitor engagement, with an effective presentation of the content across all devices. IQ Media developed a number of bespoke modules for the website and a vacancies portal that allows Capula to easily promote regional and sector career opportunities on the site. The site content is now maintained and updated on a daily basis by the Capula Communication team, through an easy to use CMS system. Mark Hardy Capula’s Managing Director commented ‘We pride ourselves on being an independent system integrator offering first-class solutions and the new website allows users to share details of our specialist solutions and pages that interest them with others across social channels including Facebook, Twitter, Google+ LinkedIn and more. Please contact us for more information and to find out how iQ Media can help enhance your digital communications and online presence.